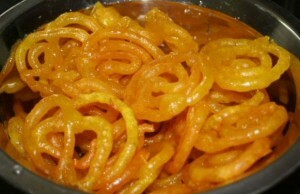 Genuine Jalaibi recipe by Ashi at DesiRecipes.com. A hot favorite sweet for any ocassion. Follow these easy steps to make this popular sweet at home. empty sauce bottle or cake decorating piping bag. Make sugar syrup by boiling water, sugar and illaichis for few minutes. put aside and let it cool down to a warm temperature. Mix self raising flour with water and add orange colour. The consistency of the batter should resemble that of a cake batter or pancake batter. Beat it with an electric beater for couple of minutes until all the lumps are well mixed. put the batter in a piping bag or a bottle with small nozzle. Heat oil in a fry pan and squeeze the batter out in a circular motion, starting from inside out. Make 56 jalaibis at a time. Make another batch of jalaibis and when they are fried, take the syrup ones out in a strainer and add the newly fried ones in the syrup. Enjoy the delicious jalaibis which are so easy to cook once you get hold of the technique. its very nice and easy method to make jalaibis....thnx for the recipe.